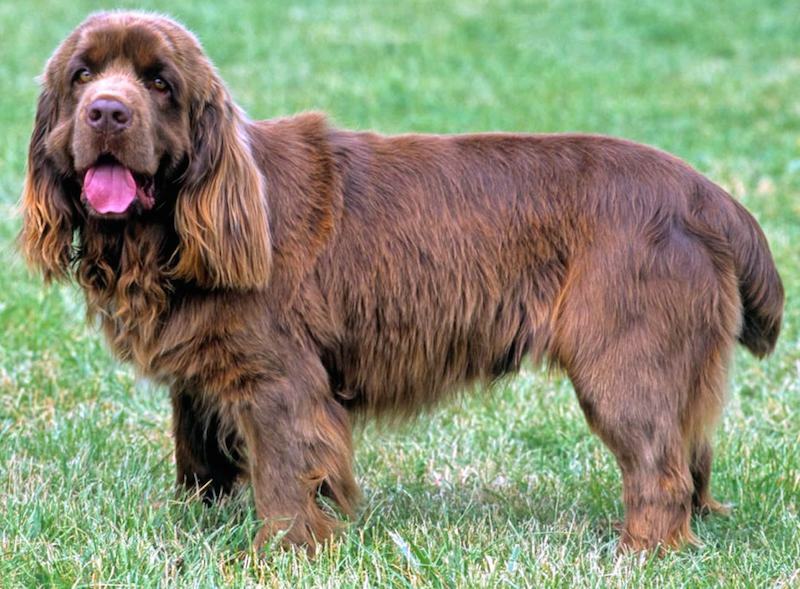 Sussex Spaniel was developed in Sussex County, England as a working spaniel. His special function was to force his way under low heavy growth and flush birds which were hiding there. He is not designed to cover large areas of ground, nor contrary to popular opinion, did he have the function of digging. In order that he can be located while hunting, he is gifted with a rich, bell-like voice. General Appearance: Long, low to the ground, massive, energetic, active and strong, with freedom of movement and nice tail action. Sussex Spaniel Temperament: Cheerful, tractable, affectionate but somewhat reserved with strangers, having a mind of his own. Size: Adult Males 14-16 inches (35-41 cm) and 45 lb. (20 kg) or more. Adult Females 13-15 inches (33-38 cm) and 40 lb. (18 kg) or more. Coat: Abundant and flat or slightly waved, with no tendency to curl, fine in texture (not woolly) with ample undercoat for weather resistance. Colour: Rich golden liver, hair shading to a golden tinge towards the tips. A small white spot on the chest, while undesirable, is not grounds for disqualification; no other white is to be tolerated. Head: The skull should be moderately long and also wide, and show a moderate curve from ear to ear, neither flat nor apple-headed, with an indentation in the middle and a pronounced stop. Brows fairly heavy and frowning; occiput full but not pointed, the whole giving an appearance of the heaviness without dullness. A well-balanced head is about 8.5 inches (22 cm) from nose to occiput in an adult. Muzzle: the adult muzzle should be about 3 inches (8 cm) long and strong, finishing in a deep, square muzzle, and the lips somewhat pendulous, nostrils wide, well developed and liver coloured. Bite scissors or level. Eyes: hazel colour, fairly large, not too full but soft in expression, not showing the haw overmuch. Ears: thick, fairly large and lobe-shaped; set moderately low, but above eye level; carried close to the head. The entire length being furnished with soft, wavy hair which should not be too profuse. Neck: Long, strong, and slightly arched, but not carrying the head much above the level of the back. There should not be much throatiness, but a well-marked frill in the coat. Shoulders and Chest: Shoulders sloping, but not too fine. The chest is round, especially behind the shoulders, deep and wide, giving a good girth. Legs: Heavily boned, strong and muscular with large, strong joints; pasterns very short and bony. The forelegs should be very short and strong, with great bone and may show a slight bend in the forearm and be nicely feathered. The hind legs should not appear shorter than the forelegs, nor be too much bent at the hocks. Stifles with sufficient angularity to give power in hind movements. Liberal hair growth above the hocks, but not as profuse below. The hind legs are short from the hock to the ground and wide apart. Feet Large, round, well-padded, and well feathered between the toes. Body: The topline should be level. The back and loin are long, well developed and muscular, both in depth and width; for this development, the back ribs must be deep and should be carried well back, though not so far as to interfere with movements of stifle joints. There should be no signs of a waist from withers to hips. The whole body is characterized as long, low, and level. Ideally, the body from the top of withers to base of the tail should be 1-1/2 times the height at the withers. Dogs more than twice as long as tall, or that are not longer than tall, should be heavily penalized; tuck-up should be minimal. Tail: May be docked or undocked. If docked, should be docked at the halfway point, about 5-7 inches (13-18 cm), set low, and not carried above the level of the back, free actioned and thickly clothed with hair and may have a moderate feather. Gait: The Sussex Spaniel moves slowly with his head at or slightly above the level of the back. Movement is free, sound, and effortless with a decided roll. It is to be kept in mind that the main requirement is brute strength. 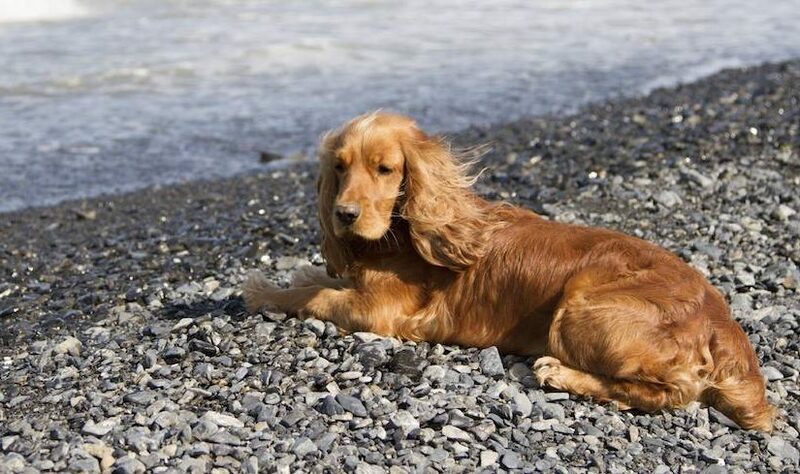 Faults: Yellow eyes, overshot or undershot bites, obesity, high head carriage, unfriendly behaviour, movement resembling that of any other spaniel. Disqualifications: More than 1 inch (3 cm) over or under recommended height, more than 10 lb. (4.5 kg) under recommended weight after the age of one (1) year; any colour other than as outlined.